About Prairie State Water Solutions, Inc.
A family-owned business, Prairie State Water Solutions, Inc. was originally launched by Steve Liberg, Sr., a veteran of the water industry. His goal: To provide the freshest water around, while operating a business founded on loyalty and mutual respect. In 1998, he began this water conditioning business, after retiring from the well drilling industry. Twelve years later, he passed his knowledge, passion, and position on to his daughter, Dori and son, Nick. Today, Dori and Nick are proud to carry on Prairie State Water’s tradition of first-rate customer service and top quality products. 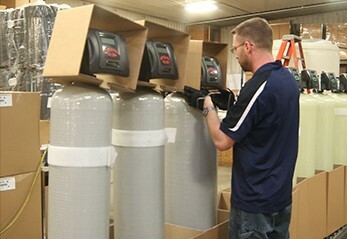 What began as a small supply shop for portable exchange tanks and supplies has grown into a global water treatment company. For over 60 years, WaterCare has been dedicated to making water good for life and has been recognized as a leader in the water treatment business. Since the beginning, WaterCare has remained at the forefront of the industry, with the latest technologies, all built in the USA, and a knowledgeable network of dealers that are ready to help. To them, water treatment means making water more efficient for your home, it means longer lifespans for your appliances, it means saving you money, and it means better health and wellness for your family. Our team of water industry experts can solve even the toughest water problems with some of the smartest equipment on the market!